Educating corporations is a critical piece of OMG’s mission. 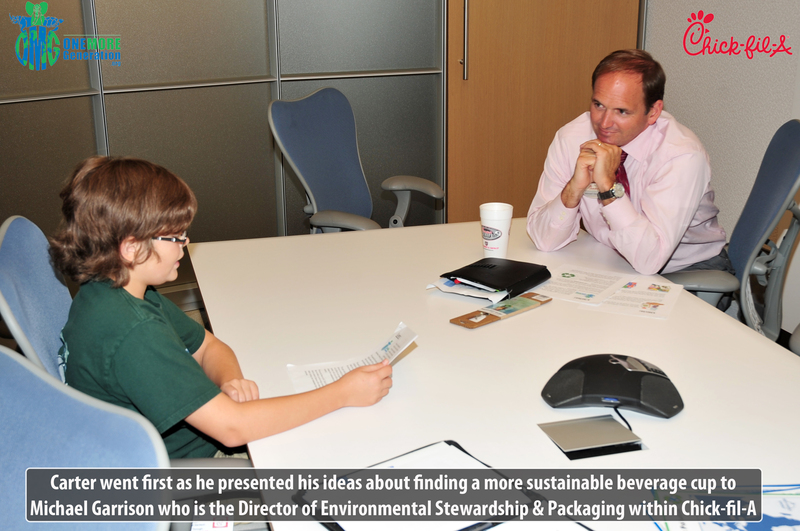 Recently, OMG Founders, Olivia and Carter met with Michael Garrison, the Director of Environmental Stewardship and Packaging for Chick-fil-A. Each of the kids presented their well-researched recommendations—solutions which could afford a clear and concise partnership opportunity that would benefit both Chick-fil-A and all the communities it serves. Carter presented the possibility of looking at alternatives to the current beverage cups. He suggested that a test be conducted for 90 days in 20 to 30 local Chick-fil-A locations where the restaurant would switch to a PET (polyethylene terephthalate) type beverage cup. An educational component in the test facilities would also be implemented, which would help customers understand why the test was being conducted and solicit their understanding and support during the test phase. This would allow us to gauge their acceptance and/or disapproval. Carter also put forth the concept of a ‘Reward’ program, where Chick-fil-A customers could bring back all used Styrofoam cups and get a discount on their beverage purchase, or perhaps even a free refill. Since the majority of beverage cups purchased are removed from the restaurants, this might be a better way to increase Chick-fil-A’s Styrofoam collection program and help reduce the number of cups that are merely thrown away. The kids presented the possibility of conducting a separate 90-day test-market in 20 to 30 local Chick-fil-A restaurants. In this test, the currently-used plastic drinking straws would be switched with biodegradable paper straws. Previously, the folks at Captain Planet had connected OMG with their sustainability department at Ted’s Montana Grill. Ted’s earlier switch from plastic straws to the new paper straws which considerably helped reduce the amount of plastic straws that end up in landfills. We commissioned Ted’s paper straw company to create mock-up straws with black and white cow patterns—a perfect fit for Chick-fi-A. These novel and memorable straws would make for a great solution to reducing the amount of plastic waste produced each year, while further enhancing Chick-fil-A’s brand. Olivia then turned the conversation towards Chick-fil-A’s Kids Meal educational booklets. These booklets are currently individually wrapped in plastic #7 clear sleeves. Olivia suggested that these sleeves were unnecessary and that removing them would afford Chick-fil-A with an easy opportunity to further enhance the company’s already environmentally friendly position. 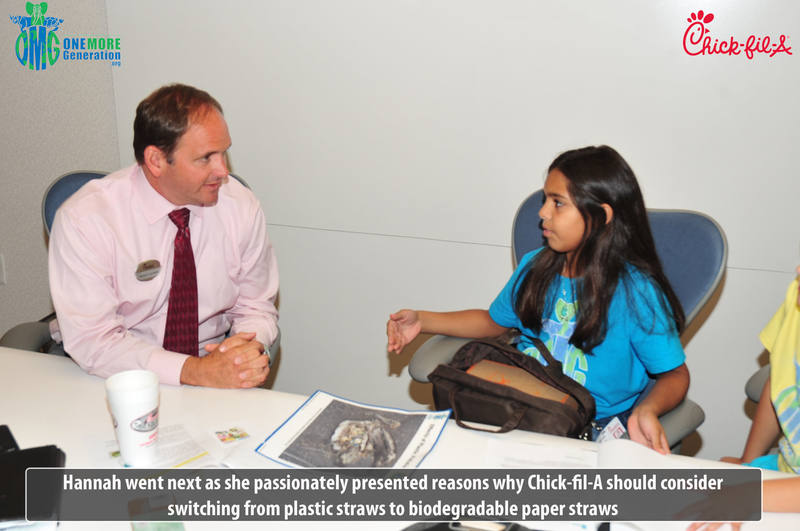 Finally, we discussed the possibility of having OMG’s Plastic Awareness Curriculum included in Chick-fil-A’s ‘Core Essentials Values’ program—an idea the company seemed receptive to. We continue to make strides such as these to help educate both corporations and the public on the damage plastic waste does to our environment. You can help us in this mission today by donating to our Plastic and Recycling Awareness Curriculum fundraising campaign. Your donations are tax deductible and all donations will be matched (up to $2500 total) by the Johnson Ohana Charitable Foundation between now and Nov 1st. Please donate today. We thank you!